The largest, fastest, and most advanced model in the CJ family. Developed for those who always expect the best, the Citation CJ4 has everything you need in your next aircraft. The featured model of the line is even more complete, with range of up to 4,010 km, interior space for up to nine passengers, and state-of-the-art flight technology and entertainment. The Citation CJ4 keeps up with your daily routine. During the week, you go to work with ease and autonomy, using all the available features to transform your cabin into an extension of your office. And when it's time to rest, travel with family and friends to wherever you want with maximum comfort. Efficient and economical, the model, which can operate with one or two pilots, employs state-of-the-art technology in its integrated Collins Pro Line 21 instrument panel and in its FADEC system which optimizes engine performance and consumption. In addition, the jet operates on short runways and, at the same time, develops excellent cruising speed, reaching up to 835 km/h. Definitely a super-machine. 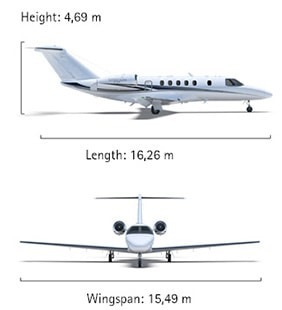 The lines and curves of the Citation CJ4 reflect the speed that the model has in the air, with bold and aerodynamic features. The spacious Citation CJ4 offers the ultimate in comfort for up to nine passengers, which includes various color and finish options.